Tonight, was another first for me. I had managed in my 34 years on this planet to avoid brussels sprout at all costs. Over the weekend, while shopping I saw a package of the little green orbs and decided….why not! I stared at them in my cart during the whole shopping trip trying to think of a reason NOT to purchase them. I came up with nothing, so they came home with me. I put them in my fridge and we engaged in a visual stand-off for 4 days. Turns out….the little green orbs are really good roasted! They looked appetizing, unlike the boiled, buttered things most people think of when you say brussels sprouts. If you haven’t tried them roasted, I highly suggest it! Tonights menu was: Teriyaki Chicken, Mashed Sweet Potato and Roasted Cauliflower and Brussels Sprouts. For the mashed sweet potatoes, I just put them in the oven to roast with the chicken (which was marinated in pre-made bottle sauce I had on hand by Lawry’s) for an hour at 350 degrees. I then removed the skin, mashed them with a fork and added some cinnamon while mashing. They were wonderful and creamy on their own with no added butter or milk. If you are a fan of brussels sprouts, I’d love to hear how you like them prepared! Nicole, that’s exactly how I make my brussel sprouts. Haven’t tried it with cauliflower but sounds like they would be great together! I love roasting them and the leaves become crisp! 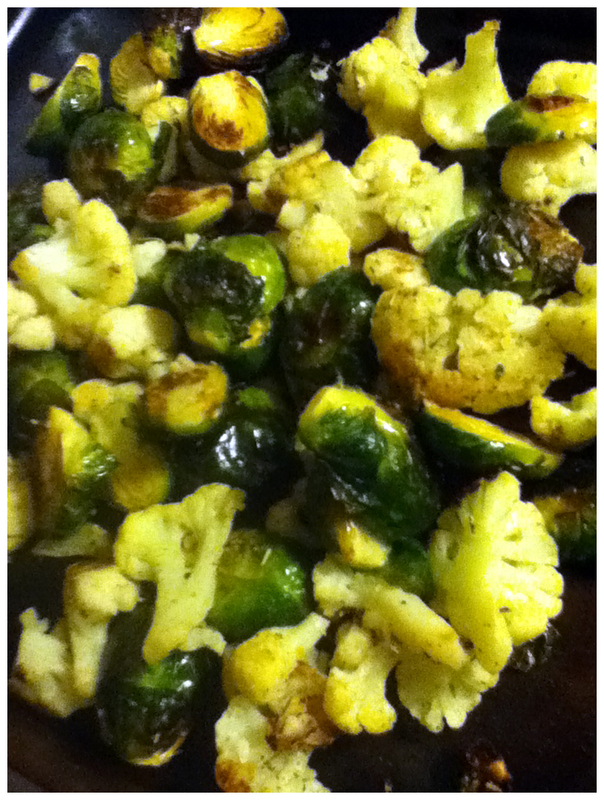 I love roasted veggies and the cauliflower tasted wonderful! They really complimented each other and the rosemary gave a nice subtle flavor.